Why is my Ethnicity Estimate different than expected? In some regions of the world there is a unique set of genetic characteristics that are shared between the offspring of native populations. While different populations migrated from one region to another, research has shown that these sets of characteristics make some regions distinct from the others, allowing us to establish a genetic model for some regions of the world. The DNA may be very similar between people in neighboring countries. Where there isn't sufficient statistical difference, we keep the Ethnicity Estimate on a higher regional level. Even when there is a statistical difference between ethnicities, it is true for the population's average. Your DNA will always be slightly different than the average population, and therefore may show a small or a significant part of neighboring ethnicities. The results you receive in the MyHeritage Ethnicity Estimate are based on an autosomal DNA test. This test analyzes DNA inherited from both your parents, giving you a range of information about where your ancestors lived before a few hundred years ago. Each person receives 50% of his DNA from his/her mother, and 50% from his/her father. The percentages of DNA a person receives from his ancestors at the level of grandparents and further back (Great grandparents, etc.) are not necessarily divided evenly in each generation. At seven generations back, probably less than 1% of the DNA comes from a direct ancestor. Because the percentages of DNA a person receives from his ancestors at the level of second generation (grandparents) and further back are not necessarily divided evenly in each generation, it is possible that one great-grandparent may have passed on 3% of his/her DNA to his great-grandchild, while another great-grandparent may have passed on 11%. This might explain some surprising results in your MyHeritage Ethnicity Estimate. 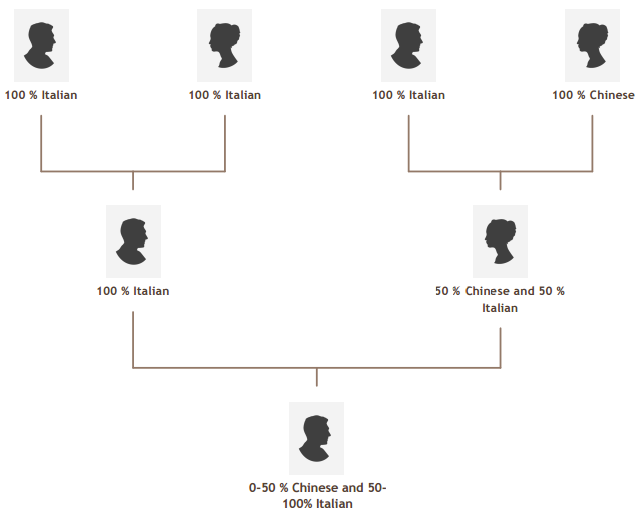 If for example one grandparent is pure Chinese, and the other three grandparents are all pure Italian, the grandchild may be anywhere between 0-50% Chinese, and 50-100% Italian. However, the probability of a person having only one pure ethnicity is very unlikely. This might also explain why some siblings may inherit certain ethnicities, while other siblings may inherit the same ethnicity in another percentage, or even may not inherit this ethnicity at all. Please note that bio-geographical estimates are complex. Different researchers analyzing the DNA of the same person can come up with different estimates based on various factors, such as the reference populations used for comparison, the algorithms, and more.